Aspasia is the main character of this enchanting novel, which will take readers back to her childhood in the Ionian colony of Miletus and her adolescence spent in the harem of Artaxerxes, the King of Persia. The high point of her life will be her meeting, as a beautiful young woman, with Pericles in Athens. In Medem’s novel, the legendary intelligence and beauty of the young Milesian will make her the perfect metaphor for Athenian splendour. 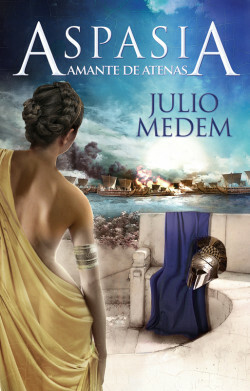 Julio Medem delves into the world of one of the most fascinating but least known women of the classical world: Aspasia of Miletus, Pericles’ lover. Aspasia is a little known character, but witnessed the splendour of Athens and was part of the circle of some of the founding fathers of western civilization. The interesting juxtaposition of an unexpected author and little-known theme will surprise lovers of historical novels, and will also appeal to a much wider audience.